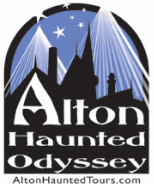 Old Bakery Beer Company and Alton Haunted Odyssey have teamed up to provide the area’s first Haunted Craft Beer Walk. The stroll includes stops at five haunted locations paired with a five-ounce pouring of one of five different Old Bakery brews. Alton’s most historic and haunted locations. in Alton, IL, home of My Just Desserts. Tours cover a distance of approximately one mile with steep hills and stairs. You must be at least 21 years of age with photo ID to participate. Please refrain from over-indulging prior to the tour. ​and no refund will be issued. Reservations are now being accepted.